Home / videos / Bypass Oppo A37f FPR/Google Account Lock without Pc. 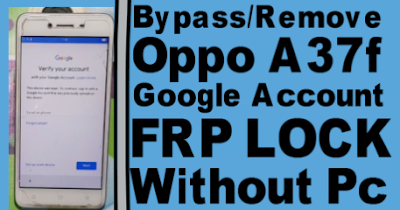 Bypass Oppo A37 FRP Required File. 1# Download Quickshortcut Maker Apk. 2# Download Google Account manager. 3# Note: This method worked for OPPO A37F,A37,A37FW. Bypass Oppo A37 FRP Method. 2# Input Sim card on your phone. 3# Go to tshort logo lick video. 4# Go to Setting and help & about. 5# Go to share tuchpal click share options. 6# Go to massage and types www.youtube.com open it. 8# Now open crome browser. 11# Download Google account manager apk. 13# Go to google account manager and logine new gmail. 15# More click next tab. 16# Go to setting and remove logine gmail and enable oem unlock. 17# Now your oppo a37f frp lock remove complite.